What is Smart Growth Planning? The Town of Clyman has formed a Smart Growth Planning Committee as of May 2009. The State of Wisconsin has mandated that all of the state's towns and villages develop a "Smart Growth Plan" by 2010. The Town of Clyman has contracted Jeff Retzlaff to consult with our committee in our efforts to develop our Smart growth plan. Jeff was heavily involved in the research and creation of our Town of Clyman zoning ordinances. He is certified by the American Institute of Certified Planners and heavily involved with planning for numerous Wisconsin communities including Menomonee Falls, Germantown, Mayville, Richfield, Hubertus and others. Jeff is a member of the Wisconsin chapter of the American Planning Association. Check this website for the dates of future meetings. A questionnaire was sent to the residents of the Town of Clyman mid-July of 2009 with an approximate 50% return. 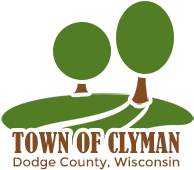 The Town of Clyman held a joint Public Hearing conducted by the Town of Clyman Town Board and Plan Commission on Thursday, December 2, 2010, beginning at 6:30 p.m. at the Clyman Town Hall, 735 Main Street, Clyman, WI. The purpose of this hearing was to accept public comment on the “recommended draft” of the Town of Clyman 2030 Comprehensive Plan. The comprehensive plan was developed to include all nine (9) elements required by Wisconsin’s “Smart Growth” legislation. The comprehensive plan will be used by the Town to guide future decision making regarding land use and development matters in the Town. Detailed maps and copies of the Town of Clyman 2030 Comprehensive Plan “recommended draft” were available for review during an open house beginning at 6:30 p.m. A formal presentation of the “recommended draft” and public hearing began at 7:00 p.m.
A copy of the 2030 Comprehensive Plan “recommended draft” is available for review at the Juneau Public Library located at 250 N. Fairfield Avenue, Juneau, WI, and on the Town’s website: www.townofclyman.org. Written comments were accepted at the public hearing, or, mailed to the Clyman Town Clerk, P.O. Box 159, Clyman, WI, no later than December 2, 2010. Unfortunately, the turnout was less than hoped for! The entire proposed draft of the Town of Clyman's Comprehensive (Smart Growth) Plan for 2030 can be accessed in 3 parts that are linked to below. The Planning Advisory Committee (PAC) for the Town of Clyman hosted a public workshop as the Town continues its efforts to collect and consider public opinion regarding future development, land use, natural resources, housing, economic development, and other community-related issues. All residents, property owners, and affected parties were encouraged to attend. With the help of the PAC members, we will attempt to identify an overall vision of what the Town should be like over the next 20 years through group discussion and hands-on activities. Refreshments were provided.